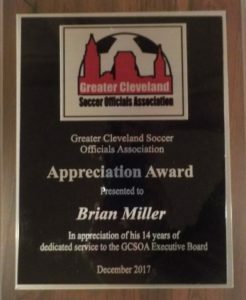 Brian is being recognized for his contributions to GCSOA as an assignor and former Board Member of 14 years. Brian has been a high school referee for 16 years. Brian’s contributions to GCSOA go far beyond the tangible. Brian spends countless hours on the phone with, watching games with, and watching young referees officiate games. Brian currently serves as Ohio North’s SYRA. Brian has been a staple at Youth Regionals and Nationals for years, and is known as one of the best mentors in the country to up-and-coming referees. Countless referees attribute their successes to Brian’s guidance, including former FIFA and current MLS Referee Chris Penso and current MLS Referee Sorin Stoica. 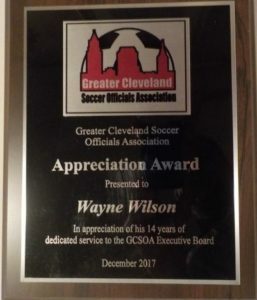 Wayne is being recognized for his contributions to GCSOA as an assignor, former Board President and Vice President, and committee member. Wayne was a high school referee for 31 years. Wayne served as the recruitment director from 1988-1990, was on various boards and committees for GCSOA from 1990-2002, was President and Vice President 3 times each from 2002-2014, and has been assigning games for GCSOA for years. Wayne’s time and effort in meeting rooms and behind closed doors are being recognized as a huge reason GCSOA has grown to one of the largest and most successful high school referee associations in Ohio.